HomeFood & BeverageFREE 7-Eleven’s Slurpee 12oz Giveaway! FREE 7-Eleven’s Slurpee 12oz Giveaway! 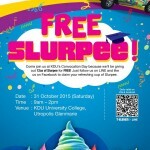 Caltex Malaysia is giving away FREE Slurpee 12oz! 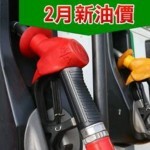 Get the freebies, when you pump a minimum of RM50 and above on petrol or diesel at selected Caltex Station! 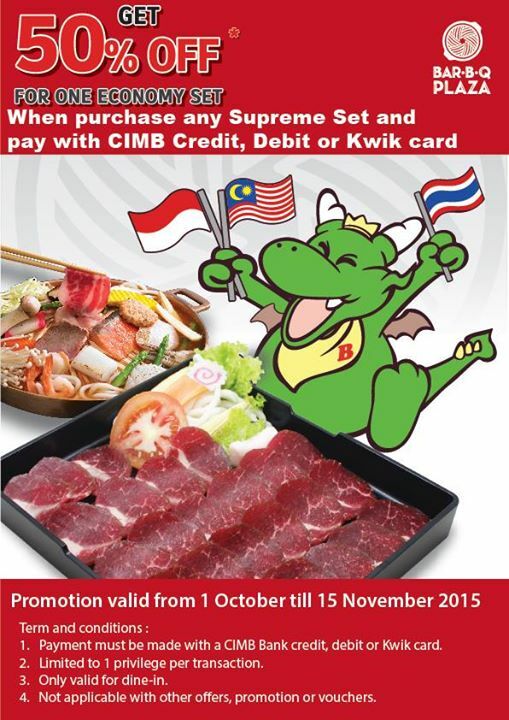 This promotion is valid until 31 Oct 2015. Upgrade for a 22oz Slurpee is only applicable to JOURNEY™ Card or BCARD card member. 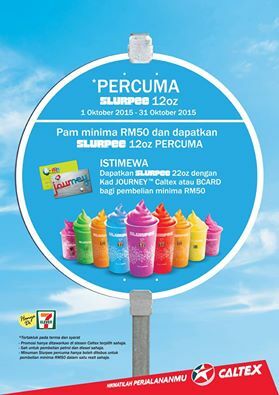 The FREE Slurpee with Caltex Promotion (“the Promotion”) is organized by Chevron Malaysia Limited, Caltex Retailers and 7–Eleven Malaysia Sdn Bhd (collectively, “the Organizers”). The Promotion shall be held from 1st October 2015 9:00:00AM to 23:59:59PM 31st October 2015 (“Promotion Period”). The Promotion is open to all Caltex customers when they pump RM50 and above on petrol or diesel in a single receipt at selected Caltex stations nationwide. Only one receipt is valid to redeem one 12oz Slurpee for free. The Promotion is strictly not exchangeable for cash. 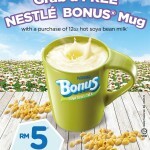 This Promotion is only applicable at eleven selected Caltex stations with 7–Eleven outlets. Get chilly with the ‘Coolest Drink on Earth’! This original frozen beverage is exclusively available in all 7-Eleven Malaysia stores and comes in unique flavours! 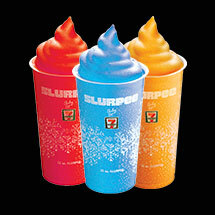 SLURPEE fun facts: More than 11.6 million Slurpee drinks are being consumed everyday around the world. So make sure you try the all-time favourites – Tutti Fruiti, Lemon Shock, Root Beer and many more! 7-Eleven Malaysia is the single largest convenience store chain with more than 1,879 stores nationwide, serving over 900,000 customers daily. 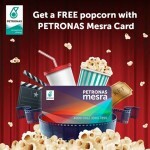 FREE TGV popcorn or mystery gift Giveaway! 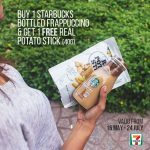 FREE 1 Starbucks Real Potato Stick Giveaway! 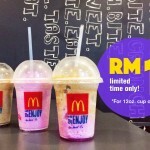 McDonald’s ice cold frozen sensation for only RM1! FREE Limited Edition Bonus Mug Giveaway! 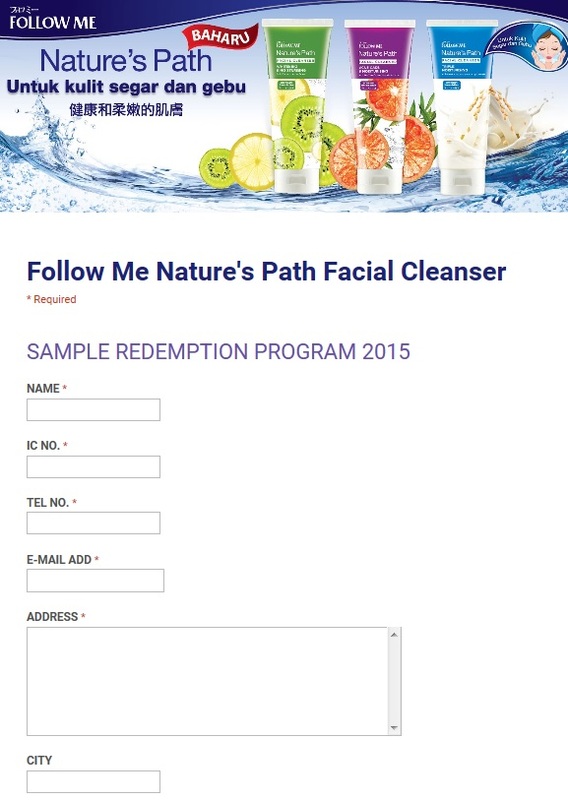 FREE Nature’s Path Facial Cleanser Sample to your doorstep!